I am absolutely head over heels flipped-out for this gorgeous necklace. 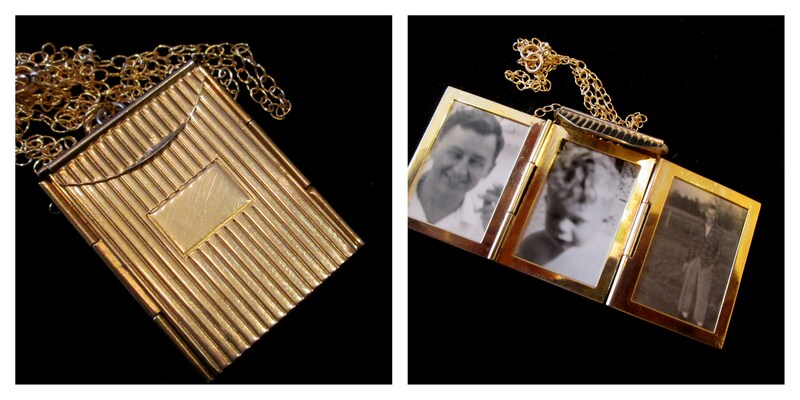 It is a gold-plated 3 picture locket which I have never seen before. It has a flap on the top that opens like an envelope to reveal the three photos. The photos inside slip in and out of a slot on the top of the locket and can easily be removed and replaced with your treasures. The outside of the locket is ribbed and the front had a small rectangle for initials to be engraved. I hung this locket from a gold-filled chain with a gold-filled spring ring clasp. This necklace is unisex. The locket was found in a "Coro" jewelry pouch, however, I don't see any marking on the locket so I cannot confirm that Coro is in fact the maker. The chain measures approximately 20 inches and the locket hangs approximately 2 inches from the chain. The locket is approximately 1.25 x 1.5 inches.